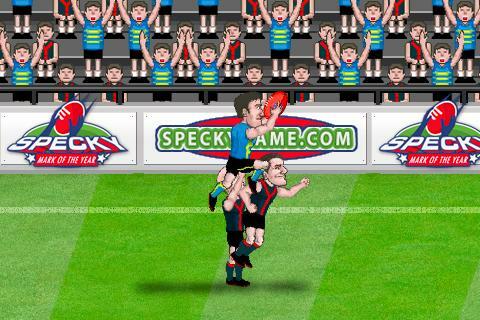 Specky Mark of the Year is the only Australian Rules Football game on the iPhone and iPad which basically allows you to partake in some outrageous speckies. 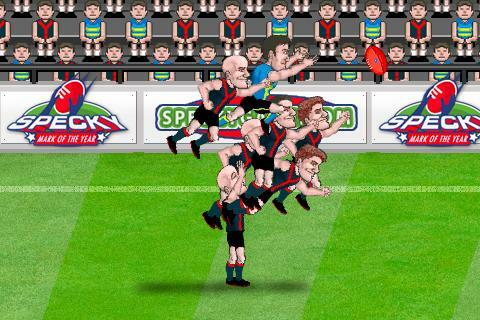 For our non-Australian readers, this means marking the football but more particularly, using your opponents body to achieve as much height as possible in order to catch the ball. 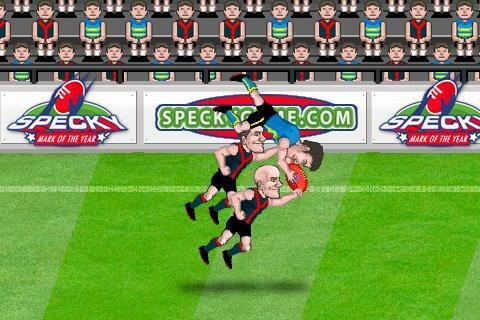 For those looking to play a full game of AFL, you'll be quite disappointed because this game is all about speckies. 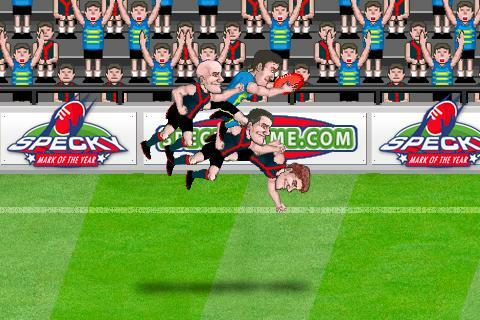 The unfortunate aspect of Specy Mark of the Year is that the gameplay does become too repetitive. With that said, the gameplay behind Specky Mark of the Year requires the player to continually tap virtual buttons which randomly moves on the screen on their iPhone in order to get a momentum of speed built up. If you are successful in pushing the red button, the game beeps at you, informing that you are successful. Once they have enough speed (your player), they will need to engage in the specky and this is done by swiping in the direction that you want to jump in order to catch the ball as you stand on the back of other players. Once you are in the air, you can then move the body of your player to mark the football. That pretty much sums up the gameplay. I think the game seems a little too basic or still a BETA version for 0.99 cents. But hey... it is AFL... sort of. On our iPhone 3GS, the loading was quite slow and the game keeps on trying to access Game Center to play this game. You can't skip it and even when you cancel it and finish a level, it will keep prompting you to access Game Center. The music behind Specky Mark of the Year is horrendous, especially in the menu system. 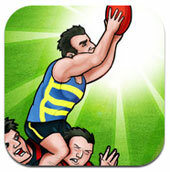 Fortunately the sound effects seem like they have been taken from an AFL game with its roaring crowd. Another problem that I had with the game is that the animation is quite basic and not very well animated. It's basically a side on image of a person running and then jumping in the air. More times than not, it looks like a stiff cardboard character jumping up in the air. I really want to help the local market but unfortunately Specky Game of the Year doesn't really do much for me. It is fun for a few levels but the repetitive nature of the gameplay is definitely a thorn in its side. As you do progress however, the levels do become a little harder but the challenge factor is not just there. I'm always annoyed how it continually tries to access Game Center. There are definitely better games out there for 99 cents. Sorry guys!